Welcome to the Sooke Fishing Adventures website! On this page, we will post regular updates on what's happening with Sooke fishing, Vancouver Island fishing, and other news of interest to our fishing friends from around the world. Reports from Sooke's waters are that there are abundant feeder winter spring chinook salmon, plus halibut, from Secretary Island westward through the Sooke Bluffs and to the trailer park. JuanDeOne provides the following report on the SportsFishingBC forum: "Fished Friday and Saturday out off the Bluffs. Non-stop action both mornings. Had to weed through some smalls as usual but easy limits of 6-10 lbs each day for two. Bonus was a 20-25 lb hali on the Friday. Fishing this productive and there were more hali hunters anchored off the Bluffs than trollers. 148' on the riggers with hootchies did the trick." Des from Vicious Fishing Charters gives a positive report too: "Fishing for winter chinook and halibut has been very productive lately. 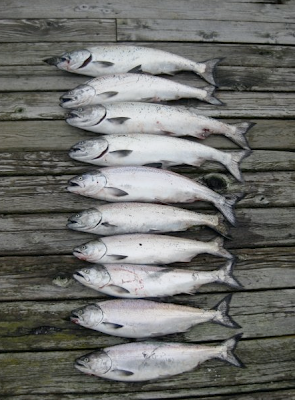 Salmon weighing 5 to 14 pounds are being caught on a regular basis as well as halibut 20 to 50 pounds. Shrimp and crab in basin are good as well"
And finally, a blog report "Vincent's Ramblings" on a bachelor party fishing trip to Sooke. 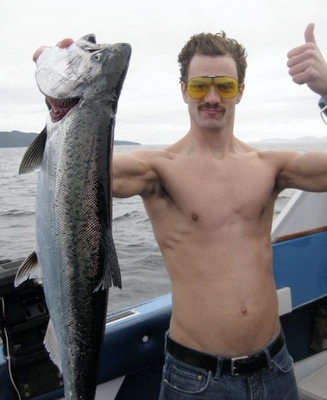 Limit catches of feeder chinook salmon, plus some pretty awesome Movember 'staches.